CF Yogi receives an Impact Grant! 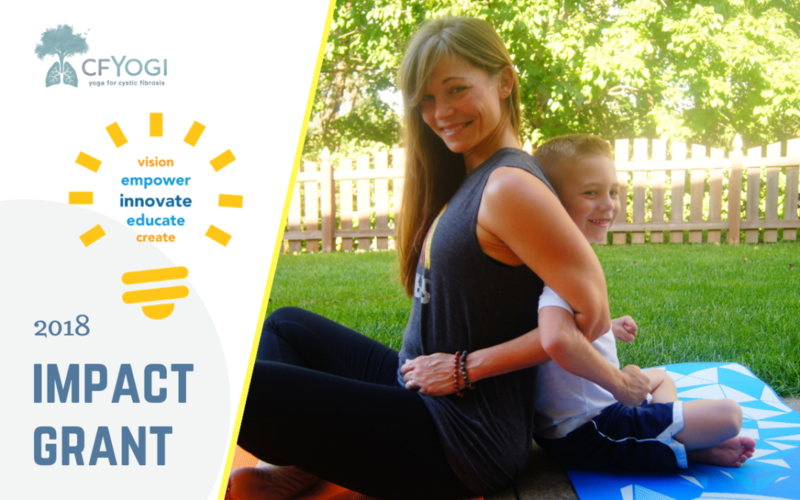 We are thrilled to announce that the Cystic Fibrosis Foundation has awarded CF Yogi with a 2018 IMPACT GRANT! The award funds an entire year of weekly livestreamed yoga classes created by and for the CF community. Our co-founders are both members of the CF community who have personally experienced the power of yoga to improve their physical health and mental well-being. Elaine K. Malik (who goes by Katie) is an adult with CF and a yoga teacher, and Myra Giaffoglione is a parent of two young children with CF who has found that yoga is a consistent source of strength and peace in her daily life as their care manager. Katie and Myra were introduced by mutual friends in 2018, and were struck by the similarity of their experiences even as their lives reflected two different sides of the coin within the CF community. Convinced of the power of yoga to improve the day-to-day lives of people with CF, but knowing it was unsafe for people with CF to be in the same physical space, they were immediately struck by the potential of virtual yoga studio that could bring livestreamed yoga classes to the entire CF community – adults and kids with CF, and their support network of parents, caregivers, spouses, partners, family and friends. Together, they applied for an Impact Grant to bring this vision into the real world. Classes begin in January 2019, and will run every week throughout the year! Here’s how it will work . . .
Weekly livestreamed classes will be held in a videoconference chat room. This way, the student and the teacher can both talk to each other. We think that this two-way communication is crucial to a positive yoga class experience, and to growing relationships in our community. While there are a lot of on-demand streaming yoga videos in the world, communication is only one-way (where the teacher is talking to the student, but the student can’t talk to the teacher). We value the immediacy that comes from having a teacher right there “in the room” with you who can talk about what you’re feeling, and be able to offer options and modifications that can make your practice fit your body. January: Multi-level yoga with Katie M.
February: Kids yoga with Myra G.
March: Gentle yoga with Aimee L.
Class rotations for the rest of the year will be announced at the beginning of each quarter. In addition to the classes above, we also hope to offer partner yoga, chair yoga, and yoga for caregivers during 2019. Students who register will receive a class schedule that includes login information of how, where, and when to join the yoga class. Make sure to sign up for our mailing list so you will be notified when a new session starts! We will regularly poll our e-mail subscribers before the month starts to see what days and times work best for a given class. For example, it may be easier for families with kids to do a Saturday morning class, or for adults with CF to do an evening class on a weeknight. As a virtual studio, we will do the best we can to find a time that works for users across multiple time zones. We want everyone to be able to participate even if they can’t join us “in the room” because of schedule conflicts. So after the weekly class, we’ll send out a link with the recorded class to registered students, so you can participate in the class at your convenience. It’s not quite as good as being there in person, but we all know life happens . . . and this way there’s no reason you have to skip your time on your mat. We value community-driven feedback about what people with CF find helpful, so that we can continue to learn from each other, and improve the community’s base of knowledge about yoga with CF. We will gather regular feedback to see which techniques, instructors, and flows are most beneficial to you in your yoga practice. And we also want to hear from you about how your yoga practice is impacting your life, on and off the mat! Plus, we will periodically invite our students to “nominate” their favorite classes for inclusion in video courses on certain themes or topics. If you or someone you love has Cystic Fibrosis, we hope you’ll join us and help us spread the word! Step 1: Sign up for our mailing list to be informed when registration opens. Thanks to the Impact Grant, classes are totally free! Step 2: Fill out our community survey so we can design our class content to best meet your needs. Step 3: Share our links with your CF community! You can find us on Facebook, Instagram, Twitter, and YouTube – please follow and help us spread the word! See you on the mat in January! Extremely excited about this Yoga program centered on Cystic Fibrosis. How fabulous!!! Thanks Linda! Hope to see you on the mat!